I have never tried this bell pepper (capsicum) rice before. Bought all the three colors bell peppers this weekend and wanted to try this one. 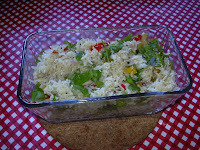 Here is the recipe I followed to make this rice. First wash and soak rice for 10 mts. After 10 mts drain it fully and keep it aside. Now take a pan, pre heat unsalted butter, splutter mustard seeds and cumin seeds. Add asafoetida powder and cashews. Fry it till golden brown. 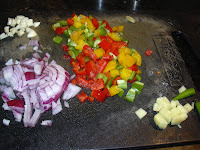 Now add chopped green chillies, ginger, garlic and onion one by one and fry it till it becomes transparent. Now add the bell peppers and stir it for another 5 to 7 mts. Now add the drained rice and saute for couple of minutes. Now transfer these ingredients to a pressure cooker. Add 2 cups of water (1:2 ratio), required amount of salt and pressure cook it upto 2 whistles. Open the cooker when the pressure is released and garnish it with coriander leaves. Serve it hot with onion raita. Priti has tagged me for a meme which I have already posted it here. wow... looks yummy & mouth watering dear...Nice entry..
Colourful dish :) Taste should be great! looks yummy & mouth watering Vidhya ..will try this..